Now, I'm turning my attention to other projects and gearing up for the "relaunch" of Return to Exile. We're calling it a relaunch because my first launch, in September, was sort of pathetic. I don't usually talk about my personal life much, and so the reasons for this patheticness might not be readily apparent. In a post last March, I briefly mentioned that I was recovering from a neck surgery. That's all I've really said about something that has dominated my life for the last two years. For nearly a year leading up to the surgery—starting within a month of selling my series to S&S—I suffered from neck/shoulder/arm pain. It got to the point where my entire right arm went numb and I spent more than half my day in bed, struggling to control the pain and get sensation back into my arm as I desperately tried (and failed) to write. During the surgery, the surgeon discovered that I had a nerve wrapped around a bone spur in my neck. He pulled out the disc, fixed the problem, shoved in a cadaver bone, and fused the vertebrae together with a metal plate. Yes, I have dead people's parts in me and I am part machine. 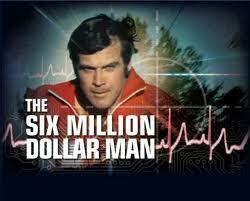 I am like the Six Million Dollar Man, not because I have any cool abilities, but because that's how much the surgery costed (bye-bye book advance). By May, I'd recovered enough to start writing again, which was good because I'd written less than sixty pages of The Legend Thief, a manuscript I was supposed to deliver in April. Fortunately, my awesome editor, Courtney Bongiolatti at S&S, was very understanding and extended my deadline. Unfortunately, by August—the month before launch—the pain started to return and I began to get zingers down my arm. The nerve hadn't quite recovered. Additionally, I had a bulging disc and a pinched nerve on the level above the fusion. The doctor put me on Neurontin, a non-narcotic medication for nerve pain, and it helped a bit. I delivered the first draft of The Legend Thief in August amidst some intense apologies (it wasn't very good at the time, unlike now, four revisions later). In September, we launched Return to Exile. After launch, I quickly discovered that I couldn't tolerate standing/sitting for more than an hour or so at a time. As a new author, no one knows who you are. If you can't get out in front of people, no one will ever know who you are and your book will suffer as a result. There's a tipping point at which word-of-mouth takes over, but you need a critical mass of fans talking about the book before that can happen. So, I tried to push through the pain and get out in front of people. My illusions around "heroic will" triumphing over all obstacles came to a sad end when, after spending six hours at various Costco signings, I ended up in the ER, unable to string a complete sentence together. The aggravated nerves in my neck had caused muscle spasms that pinched the arteries and slowed the blood flow to my brain. At least, that was the best guess after ruling out stroke and other possibilities. Fortunately, there was no permanent damage, though those who commonly read this blog may disagree. That event pretty much ended my launch before it even began. Since then, I've focused on revising The Legend Thief. My creativity—which was stymied by pain and possibly Neurontin (which I went off of in December)—has slowly returned. I've worked with a physical therapist for several months, and my neck is now pretty much under control. In February, I presented at the "Life, the Universe, and Everything" symposium to test the waters and see how well my neck would hold up, and I'm happy to say it went great! I'm back. I'm ready. We're relaunching Return to Exile. I'm late to the game, and I could use some help. If you are a blogger, click here to sign up for the Return to Exile blog tour. Signing up basically means that you'll mention Return to Exile on your blog on whatever date you sign up for. This could include a review, a giveaway, an interview with me, or even a simple mention or link on the side of your blog—whatever you want. You don't have to blog about books to sign up. All blogs—books, foods, crafts, parenting, whatever—are invited! We have over twenty amazing blogs that have already registered for the tour, so join the party! The more the merrier! Additionally, we're trying to setup school visits as part of the tour. If you're a teacher, librarian, principal, or other academic sort, click on the "For Educators" tab to learn more about inviting me to your school. I know it's the end of the year, your schedules are full, and you're out of budget. I wish I could do all my visits for free, but a six million dollar surgery is a lot of surgery to pay off. Having said that, we are willing to work with you no matter where your school is located, or your circumstances, so don't hesitate to contact us (and by "us," I mean my assistant who is handling all of this). My presentation is different from anything you and your students might have seen before (see "For Educators" for more info), and I'd really love to visit as many schools as possible before the end of the year. Invite me! You won't be disappointed! Finally, spread the word! Tell everyone you know to buy the book! Like my Facebook page! I have a lot of ground to make up and it's all uphill. I appreciate every ounce of support, and a big thank you to my fans, my family, my friends, my editor, my agent, and all the others who have supported me through this! You have no idea what your encouragement has meant!